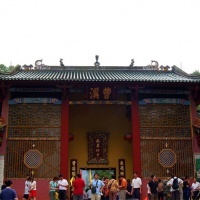 Nanhua Temple is a famous Buddhist site with a history of over 1500 years, where the sixth Founder of Buddhism Hui Neng established the southern sect of Zen. 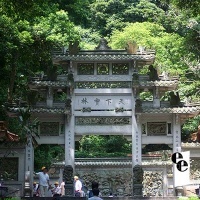 The temple is located 22 kilometers away from Shaoguan, right at river bank of Caojiang, the Maba Town. The Nan Hua Temple is built in year of 502 by the Indian monk of Zhiyao Sanzang. Covering an area of 42.5 hectares, it is leaning the mountain and facing the south, with a series of magnificent Buddhist buildings in traditional Chinese architectural styles. Most of the existing buildings were renovated in 1934. The Magnificent Hall of Heavenly Kings was built in Ming dynasty and rebuilt in Qing dynasty, with the original statue of four heavenly Kings left; The Grand Hall built in 700 years ago, standing in the center of the temple featuring at glazed tiles, is the largest Buddhism architecture in Guangdong province. The sublime statues of Sakyamuni, Medicine Buddha and Amitabha are situated in the sacrarium of the hall with other 500 clay sculptures of Buddhist arhats. The Lingxi Tower in the temple were originally built in early Tang dynasty, the last reconstruction changed the wooden tower into brick tower during Ming dynasty. It is the oldest and highest structure in Nanhua Temples. The real body of Hui Neng was placed within the tower, which remain his original appearance through over 1000 years. There are still many cultural relics preserved as national treasure inside the temple, including the old-silked cassock with one thousand Buddha and decree by Wu Zetian, wood-carved arhat in Beisong Dynasty, copper clock of thousand Jins , pan of thousand people in Yuan Dynasty, steel tower of thousand Buddha in Qing Dynastry and Dazang Sutra written with gold and so on. Is there a lodging inside Nanhua Temple where we can stay?